Very nice...what's in store for it? Is it possible to fall in love with a yarn cake? Stop making us drool . . .
You're killing me here. That is delicious. Beautiful. Looking forward to seeing it evolve. . .
Wow! That steel gray blue colour is so beautiful! Lucky I have the Yarn Focus Challenge (kind of a yarn diet) to protect me from this temptation! Gorgeous. I noticed your portrait series over on Flickr and was wondering if there's a quality to the yarn wound, as opposed to in a hank, that you feel makes it more amenable to a portrait. Yumm...Yumm... Wish feel-a-vision was invented already. who, may I ask, is David Daniels? You take the loveliest pictures. Love the photo. What's it going to be? 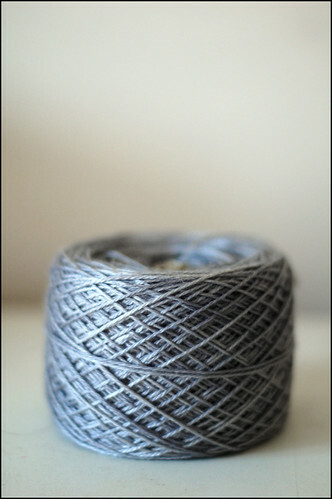 Merino tencel -- what a great blend. That color is gorgeous, too. What does it want to be when it grows up? Cake between friends - love it. I sense a Project Spectrum somethin' somethin', yes? mmmm... i love your yarn portraits. lovely. Dave does have a knack with color! Beautiful, peaceful color. Looking forward to seeing what it becomes. i cant wait to see what u do with it!!! love dave, love his yarn. the photo is beautiful. That's some great advertising for Dave. You should check out Anne of www.knitspot.com for some manlace to go along with it. I love this stuff! I have a pair of socks out of the 'Concord' colorway and it is amazing!!!! I love to spin merino tencel and recently bought some roving exactly that color from Mama E. Now that I see your yarn, I think I'm going to bump it up in the queue! I think Dave should be up to his eyeballs in dye because we all want that yarn! how do i get my hands on dave? i love that silver! The color of that cabin cove is stunning! Breathtaking! Goodness me did you do all that knitting? Great knitting and really great pictures. Just came across your blog today.